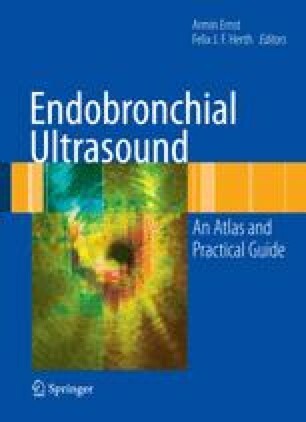 Endobronchial ultrasound has established itself as a powerful tool for guiding transbronchial needle aspiration and, therefore, the diagnosis of thoracic lesions and staging of cancer. All aspects of EBUS TBNA are described in detail in other chapters of this book. It is important to consider EUS FNA in this context. Gastroenterologists have been using ultrasound-guided needle aspirations for longer than pulmonologists have been using EBUS. EUS FNA has established itself not just for diagnosis of abdominal lesions, but also extensively for the diagnosis of lesions within the thorax. This obviously does make sense, since the esophagus runs alongside the trachea and many mediastinal abnormalities are within reach of the EUS FNA procedure.